£65.00 per person 10am - 2pm. This informal workshop will equip you with the necessary skills you will need to develop your own personal style and beautiful creations. This 3 hour course, hosted by Simon Wood, is suitable for complete beginners, those who have used the paint before and those wanting to learn a new skill. We will provide all you need for the course, plus lunch and refreshments throughout the day. All you need to bring is yourselves and come prepared to paint. You will also receive 10% off all Annie Sloan painting products bought on the day. This three hour course, hosted by Carrie Williams and Simon Wood, is designed to bring your creative side to life and build on your knowledge as you explore and experiment with the finer detail and finishing techniques, like transfers, ombre, gilding and stencilling. This two hour course, hosted by Simon Wood and Carrie Williams is great for people with previous experience using Annie Sloan Products, that want to hone in on certain skills. The course lets you experiment with any of the finer detailed finishing techniques, like decoupage, craqueleur, gilding waxes, brass leaf and stencilling. You get free range of tools and equipment so you can choose whichever style you'd like to use on the bottle provided, which you can take away at the end of the course with a light attachment for inside to create a lovely lantern for your home. We will provide all you need for the course, plus refreshments for the day. All you need to bring is yourselves and come prepared to get messy. This six hour course, hosted by Simon Wood and Carrie Williams is great for people wanting to learn how to paint and recover a chair. We provide the chair and a choice of material and talk you through a step by step guide on how to use Annie Sloan Paints and products with furniture, plus how to do a basic recover on the padded seat. You have free range on colour and finishing techniques to create your very own individual piece. We will provide lunch and refreshments throughout the day, so all you need to bring is yourselves and come prepared to paint. This three hour informal workshop will help you to create a beautiful Lampshade for you to enjoy in your home. We will start off by stencilling a pattern of your choice onto Annie Sloan Linens until you are happy with the final piece, then we go on to make your 30cm diameter lampshade for either a table lamp or ceiling light. We provide everything you need on the day so please just come along and enjoy, then take home your wonderful creation. This two hour informal workshop will help you to create a beautiful Lantern that holds a battery T-Light for you to enjoy in your home. We will start off by stencilling a pattern of your choice onto Annie Sloan Linens until you are happy with the final piece, then we go on to make your 10cm diameter lantern for Battery lights. 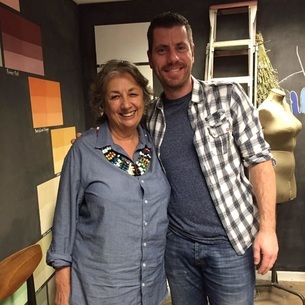 ​This two hour course, hosted by Simon Wood and Carrie Williams is great for people with previous experience using Annie Sloan Products, that want to hone in on their craqueleur skills, or a complete novice to the technique and Annie Sloan products. During the course you will create a lovely bottle candle holder using Decoupage and craqueleur with different waxed finishes for you to take home and enjoy. This two hour course, hosted by Simon Wood and Carrie Williams is great for crafty people who love to decoupage, paint, glue and generally be creative, using Annie Sloan Products and lots of extra crafty pieces. During the course you will create a lovely photo frame using a range of Decoupage mediums and embellishments, ready for you to take home and enjoy. This fun little course, lets you create 3 sheets of wrapping paper to take home and wrap your special presents. Come along and enjoy this 1 hour course with a glass of fizz. ​We provide everything you need on the day so just bring yourselves and enjoy. This course is based on what skills you'd like to learn or if you have a piece of furniture in mind that you'd like help with, Simon Wood or Carrie Williams can talk you through a step by step guide on how to achieve the look you are after. Dependant on what you'd like to learn we offer an hourly rate service for one to one course but can also tailor make packages for groups wanting to book. We provide the paint and materials needed for any Annie Sloan Project which is included in the price per hour, all you need to do is bring in your item.